Innovative intersection and interchange geometrics are spreading across the country as a way to accommodate traffic volumes more efficiently while enhancing traveler safety. Through Every Day Counts, the Federal Highway Administration is promoting displaced left turn intersections, U-turn intersections, diverging diamond interchanges and roundabouts. U-turn intersections are a family of intersection geometrics that share a similar strategy for using indirect left turns. They include restricted crossing U-turn, median U-turn and ThrU-turn intersections. These designs boost safety and improve traffic flow by eliminating, relocating or modifying intersection conflict points. Minnesota is one state that’s reducing severe right-angle, or T-bone, crashes and improving travel times with restricted crossing U-turn intersections. The Minnesota Department of Transportation has used them at several high-crash locations on four-lane divided highways and plans to build more. 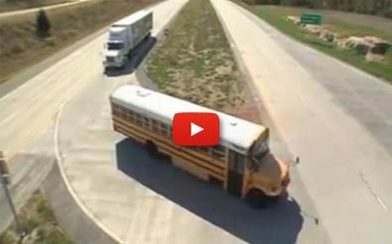 The video below explains how the intersections work and why they increase safety. The Arizona Local Public Agency Stakeholder Council held its first meeting on December 5 in Phoenix. The council is the Arizona Department of Transportation’s first step in developing a formal partnering process with local public agencies under the Every Day Counts effort on locally administered Federal-Aid projects. The council includes state, local and federal agency representatives from throughout Arizona. Its quarterly meetings will provide a venue for local agencies to discuss questions, concerns and suggestions on implementing Federal-Aid projects in their jurisdictions. The Minnesota Department of Transportation and the city of Hastings dedicated the new Hastings Bridge on U.S. 61 over the Mississippi River on November 22. The bridge features a 545-foot-long tied arch span, the longest freestanding tied arch in North America. The bridge was designed to visually complement Hasting’s historic district. Work on the $130 million design-build project began in 2010. This time-lapse video shows the installation of the arch span. Nearly 100 consultants, contractors and public agency staff participated in a December 10 workshop in Concord, N.H., on three-dimensional engineered models for construction. The workshop focused on the return on investment on 3-D technology and how to use it from the perspective of a consultant, contractor, software designer and state highway agency. New Hampshire contractors use this technology for automated machine guidance. The New Hampshire Department of Transportation has committed to moving forward on 3-D modeling to accelerate construction, enhance productivity and improve safety on construction projects. The North Dakota Department of Transportation and FHWA North Dakota Division executed a State Transportation Innovation Team charter on December 12. The team provides a forum for implementing and overseeing the deployment of innovative processes and technologies in the state. The goal is to make innovations, such as those FHWA is promoting through Every Day Counts, standardized activities to improve project delivery, quality and effectiveness.